RUTLAND—The Vermont Fish & Wildlife Department has certified four new all-time state record fish, all caught in 2015, according to a Feb. 17 release. New state records were set for the species of yellow perch, redhorse sucker, cisco and bowfin (taken by bow and arrow). Vermont’s new record yellow perch, which weighed a massive 2.4 pounds, was caught in March by Keith Sherwood of while ice fishing on Caspian Lake in Greensboro. The fish was 16 inches in length and had a girth of 12.5 inches, and topped the previous record of 2.1 pounds by over 4 ounces. In April, Brian Latulippe of Hinesburg landed the new state record redhorse sucker while fishing on the Otter Creek in Ferrisburgh. The fish was caught using a nightcrawler and weighed 9.01 pounds. It had a length of 27.5 inches and a girth of 16.5 inches. The former record weighed 8.6 pounds. 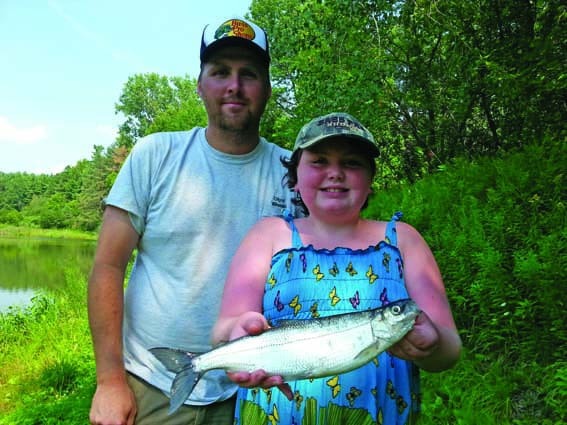 Fishing has always been a great activity for families to share and experience together, and in keeping with the family theme, the new state cisco was caught by Brian’s niece, Montanah Latulippe, of Winooski. Montanah caught the fish in August on Lake Champlain in South Hero. It weighed 1.09 pounds, was 14.5 inches in length, and had a girth of 7.5 inches. This was the first cisco ever officially submitted to the department’s record fish program and therefore automatically takes the top spot on the record fish list. A new state record was also set for bowfin taken by bow and arrow. The fish was harvested in August by Louis Phelps of St. George on Lake Champlain in Grand Isle. It weighed 12.09 pounds, was 30.75 inches long, and had a girth of 17.25 inches. The previous record weighed 11.6 pounds. Vermont Fish & Wildlife recognizes state records for both traditional angling and for bow and arrow fishing for the species of longnose gar, carp, redhorse sucker and bowfin. To learn more about Vermont Fish & Wildlife’s record fish program, view record fish entries, or purchase a Vermont fishing license, visit vtfishandwildlife.com.